What is SMSS.exe And Why it is Running ? You are here: Home / Utilities / What is SMSS.exe And Why it is Running ? There are many processes that run behind the scenes in Window’s operating systems. One of these processes that may look suspicious is the SMSS.exe. This is an execution file with the full name Session Management Subsystem(Smss). The Session Manager Subsystem is responsible for starting a user’s session. When this process begins, the system thread is responsible for a number of specific tasks including launching the Winlogon, specific Win32 processes and among other items, setting the system variables. Many computer users first notice the SMSS.exe process when a system shuts down abnormally. For instance, when a Winlogon ends normally, this process usually has no problem fulfilling its tasks, however, when a system shuts down abnormally or unexpectedly, the SMSS.exe causes a “hang” which is when the system stops responding. It should be noted that the SMSS.exe file is always located in the C:\Windows\System32 folder. If you find that there is an smss.exe located in another folder, then be aware that it is probably malware (either a virus, spyware, trojan or worm). 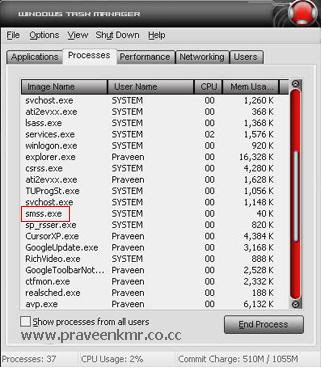 Many malware programs try to look like legitimate computer processes and the smss.exe trojan is one of them. Many times malware in the form of smss.exe is a trojan called Flood.F. Flood.F is considered to be a serious security risk. Like most trojans, Flood.F can steal or reveal sensitive data or documents. Many computer users that are infiltrated by a trojan horse can be subjected to their personal and financial information being stolen and used for credit card fraud or identity theft. There are quite a few ways to remove trojans. For instance, the smss.exe Flood.F trojan can be removed with many commercial applications such as Antivirus Softwares.